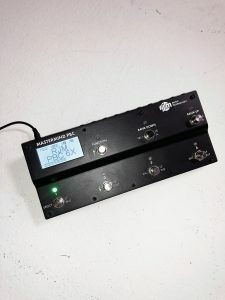 PBC/6X New Pedalboard Controller with Loop Reordering | RJM Music Technology, Inc. Thanks for checking out the Mastermind PBC/6X. Here are some answers to the Frequently Asked Questions. What’s new about this model? The big new feature is the ability to rearrange loop order. Your effects can automatically be placed in a different order for each preset. Aside from that, it’s smaller and less expensive than the original Mastermind PBC, making it more suitable for smaller pedalboards. No, we’re selling both PBC models. We’ve had some requests but with enough request we may be persuaded. Email support@rjmmusic.com if that is something you really want. Be aware even if we decide to do a project like this (and we have not decided ) it would take 6-12 months before we’d be ready to ship. 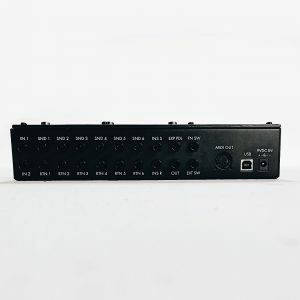 Why doesn’t the PBC/6X have a line mixer? The PBC/6X doesn’t include a line mixer (parallel support) like the PBC/10 does because the goal of the PBC/6X was to reduce the size and cost. Having a line mixer would interfere with those goals. However we do sell a Mini Line Mixer and you can use that with the PBC/6X to run up to 3 effects in parallel. RJM Music’s Pedalboard with the new Mastermind PBC/6X which has loop reordering. Quite a bit fits on a small board! The photo above is of the Pedalboard that RJM Music made to show off how much you can fit on a small board. 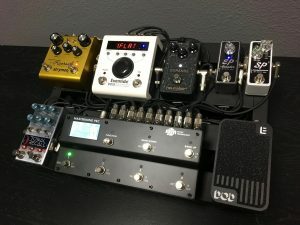 On the board is Strymon Riverside, Exotic SP Compressor, Exotic EP Booster, Chase Bliss Tonal Recall, Neunaber Expanse, DOD Mini Expression pedal, and Eventide H9. Powered by Strymon Zuma . The pedalboard is a PedalTrain Junior. When can I order the PBC/6X? We expect to allow pre-orders mid February 2019. Send support@rjmmusic.com an email if you’d like to get an email when we start taking pre-orders. What is the price for the PBC/6X? I have a Rig Builder who is going to build my pedalboard. Should I preorder through RJM or my Rig Builder? If your rig builder is a professional who already works with RJM and has an account with us, contact your Rig Builder to preorder. Where is the best place to keep updated on the PBC/6X?